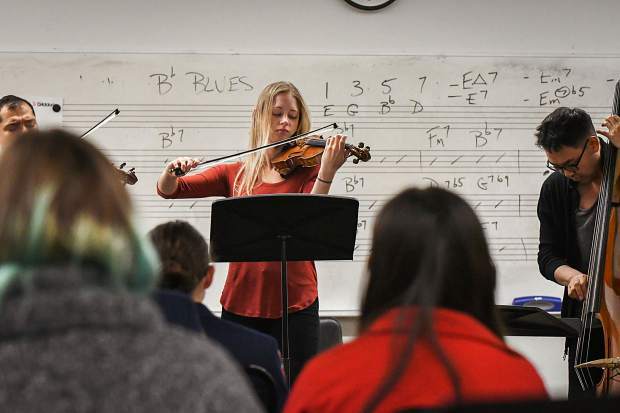 Dallas String Quartet violinist Melissa Priller performs with other band members for music students at Glenwood Springs High School on Tuesday morning. 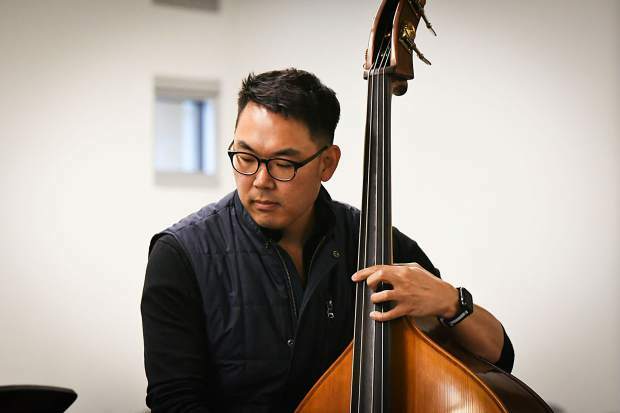 Bassist Young Heo performs with the Dallas String Quartet for music students at Glenwood Springs High School on Tuesday morning. 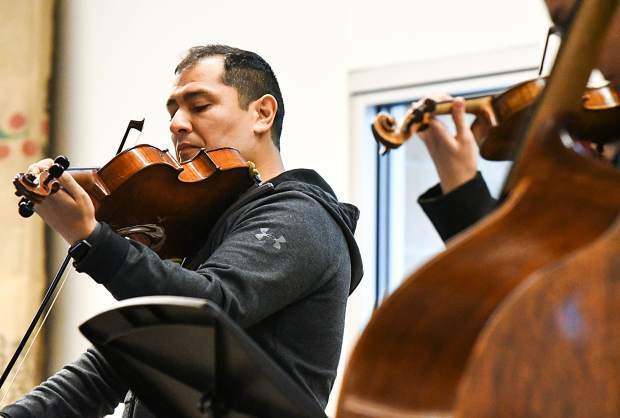 Dallas String Quartet founder Ion Zanca performs with other band members for music students at Glenwood Springs High School on Tuesday morning. 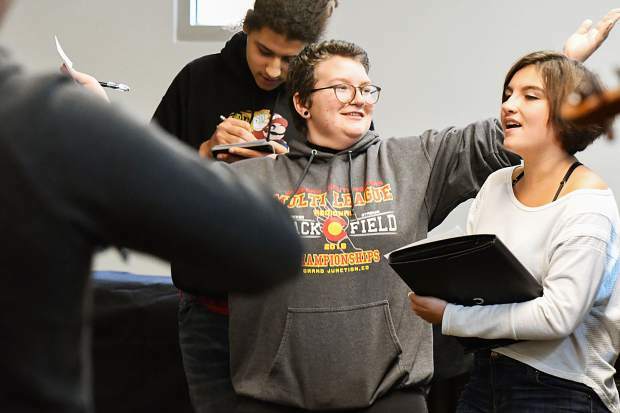 Glenwood Springs High School students Gabriel Bianco, left, and Sequoyah Recio play a guess-the-song-name game with the Dallas String Quartet at the school on Tuesday morning. 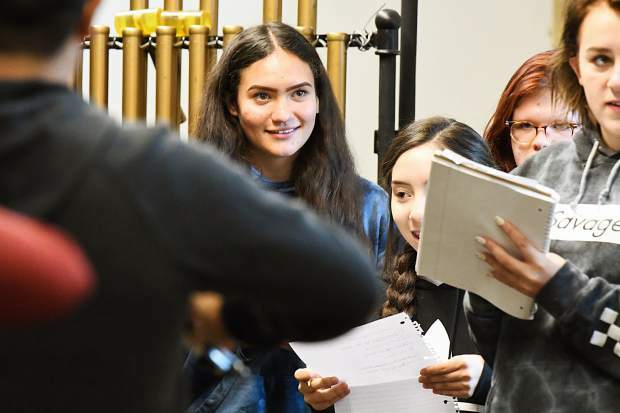 Glenwood Springs High School band student Natasha Lozano plays a guess-the-song-name game with the Dallas String Quartet at the school on Tuesday morning. 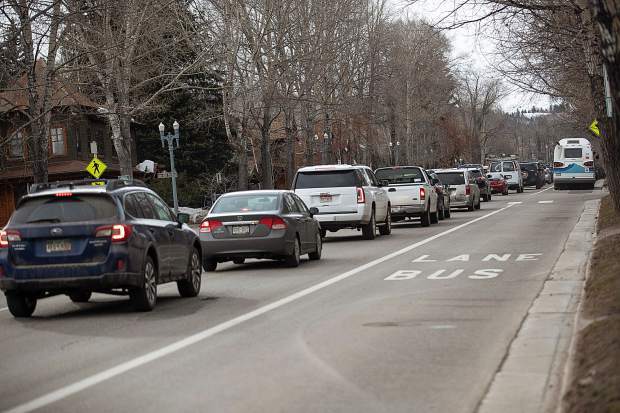 The melodic sounds of classical music echoed through the stone and mortar halls of Glenwood Springs High School Tuesday morning, as members of the Dallas String Quartet performed a few old standards during Symphonic Band class. A mix of freshmen, sophomores, juniors and seniors, ranging from beginners to some inspiring young musicians, sat poised in their seats quiet as church mice. Looking for a little more interaction from the crowd, composer, violinist and DSQ founder Ion Zanca, violinists Eleanor Dunbar and Melissa Priller and bassist Young Heo asked students what was on their playlist. Jaws dropped as DSQ broke into Michael Jackson’s “Smooth Criminal,” leaving the students wide-eyed, with some bobbing their heads to the beat and others joining in singing the lyrics to the famous pop song. “Watching all the surprises on their faces when they hear us play the pieces they are listening to on their phones,” violinist Melissa Priller said of her favorite part about engaging with the students. The Texas-based quartet, in town to perform as part of the Glenwood Springs Community Concert Association’s concert season, spent the morning interacting with students, sharing their music and passing down what they have learned in their careers. “I think it’s a wonderful experience for young musicians to interact with professional musicians,” GSHS music teacher Tim Caskin said. According to Caskin, Tuesday’s event was kind of unique, with a class of wind instrument players having a chance to witness professional string players in action. 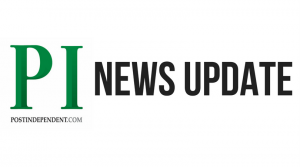 “To hear about their experience of becoming professional musicians and just hearing that kind of quality performance for younger people is a very valuable thing,” Caskin said. The musical knowledge of the class inspired a game of guess-the-song, where the quartet played parts of five songs and the students had to guess the name of each song. “It’s so fun to see what is modern and current right now, and seeing the kids reaction to what we are doing,” violinist Eleanor Dunbar said. “Really thinking about playing the violin now,” GSHS junior Thaleia Castillo said, after watching and listening to the quartet. With no clear winner, the game went into sudden death, as the class of 34 students was whittled down to a group of a dozen classmates to see who went home with an autographed copy of DSQ’s latest album. The quartet pumped out hit song after hit song trying to stump the students, from “Livin’ on a Prayer” by Bon Jovi, to “Viva La Vida” by Cold Play. Geisler prevailed, with junior Sean Phillips taking home second-place honors. “I just love to see them so relaxed and see them actually enjoy it,” Zanca said. Zanca encouraged the students to try new things with their instruments, make the songs their own, and truly explore the music.